The Four Creeks UAC holds public elections every two (2) years at the regular November UAC meeting. Any person registered to vote in King County who has their primary residence within the boundaries of the Four Creeks Unincorporated Area is eligible to vote in UAC elections. Voting is done in person at the Election Meeting. The Four Creeks service area covers just under 50 square miles and includes both urban unincorporated and rural areas. Although there are exceptions, most of the Four Creeks boundary aligns to King County Voting Precincts. The Four Creeks UAC serves residents of the unincorporated area east of Renton and Newcastle, south of Bellevue and Issaquah, and north of the Tahoma School District. The area is divided into ten Districts, each with one member, with five additional At-Large members (see map below in the Member Positions section). To determine your precinct, refer to your voter registration card. Candidates may submit their Declaration at the Election Meeting. No other notification is required for candidates attending the Election. 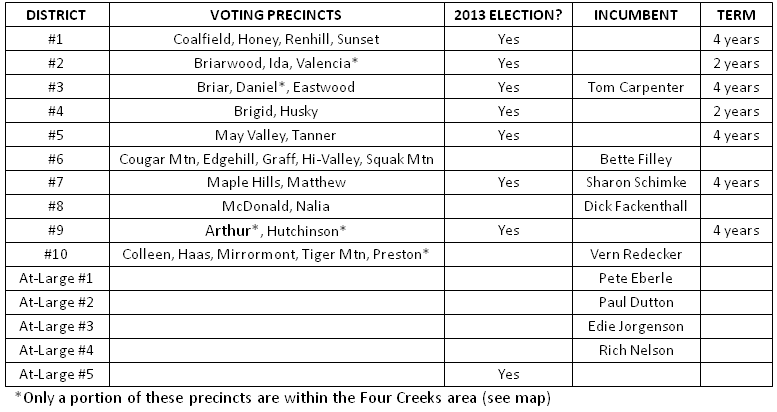 Candidates who cannot attend the Election Meeting (absentee) may submit their Declaration via email to council@fourcreeks.org or via mail to: Four Creeks Election, P.O. Box 3501, Renton, WA 98056. Absentee declarations must be received by the “due date for absentee” specified in the election calendar. For additional information including district maps, visit www.fourcreeks.org or e-mail council@fourcreeks.org. YES: The cost of using mail ballots has become prohibitive. Other UACs use an Election Meeting for their elections. YES: Members may be appointed to positions not filled by an election. The UAC works on appointments between the election and the January meeting when the new membership is seated. The Four Creeks service area is divided into 10 member districts designed to be geographically dispersed assuring a broad view of the area. As part of a 4-year transition to bi-annual elections and 4-year terms, all member positions were subject to election in 2011. At that time, all odd-numbered District positions were elected for 2-year terms. All even-numbered District positions and all At-Large positions were elected for 4-year terms. This means that in 2013 all odd-numbered District positions and any vacant even-numbered or At-Large positions are up for election. In 2013, District positions #1, #2, #3, #4, #5, #7, #9 and At-Large position #5 are up for election. An annual update to the District/Precinct list in the FCUAC bylaws has been proposed. Vote on the changes is scheduled for the September, 2013 regular FCUAC meeting. Although FCUAC elections since 2011 have been done at the regular November meeting, the UAC does maintain procedures for conducting a mail ballot election if warranted in the future. In addition, although not directly a part of the election process, appointments are closely related so the procedure is included here.